What is the meaning of Qurbani? 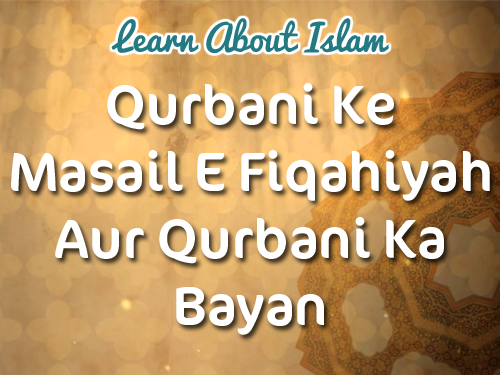 What is the Niyat or Dua for Qurbani? 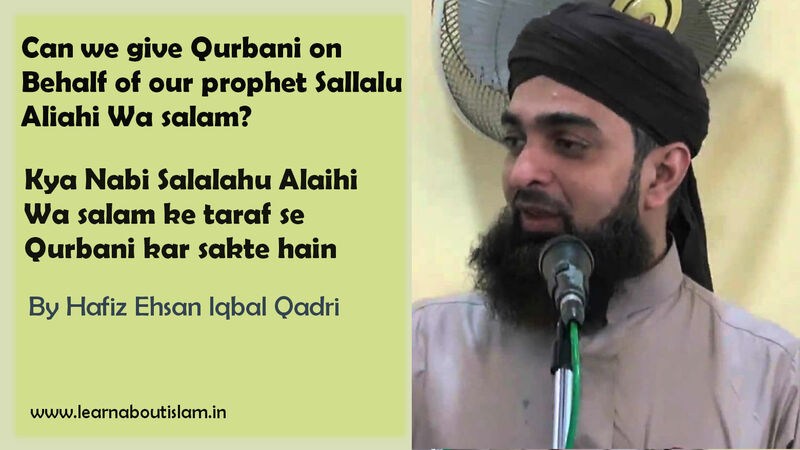 Who should perform Qurbani? 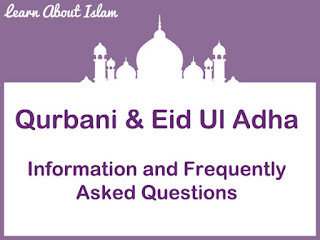 What are the conditions for Qurbani? For the condition of sacrificing, the Malik-e-Nisab is the person who possesses 52 ½ tolas (620 grammes) of silver or 7 ½ tolas (88 grammes) of gold; or they have the same amount equivalent to either of the above item in value in business goods or non-business goods, which are not goods that are the basic necessities of life. The wealth and/or property should be ‘extra’/above one’s basic necessities (hajat-e-asliyyah). How many animals must be sacrificed in Qurbani? There are 7 parts of share in large animal such as a camel, cow, buffalo etc. So 7 persons from a house or any other can take part in a qurbani of the large animals. In Small animals such as goat or a sheep, there is one share. So each single person, One goat or sheep must be sacrificed. What is the correct method of slaughtering an animal? How to slaughter an animal? The method of sacrificing an animal is to lay it on its left, such that its face is towards the Qiblah and then place the right foot on its side and holding a sharp knife (concealed obviously from the animal or if it is blind-folded then there is no harm). 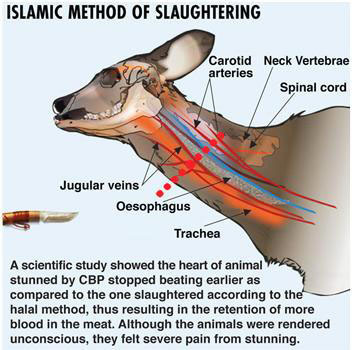 If 3 from the 4 veins were cut or most part of each vein was cut, then the slaughtered animal is Halal. It is Haram to eat an animal slaughtered by an infidel, an apostate, Dehriyah or a neichri, and every other heretic. Whom should be the Qurbani Meat be given? How should the meat be distributed? The meat from Qurbani must be equally divided in three equal parts: One for the home, One for relatives and friends, and One for the poor and needy. Tarjumah : "Tum Apne Rab Ke Liye Namaz Pardho Aur Qurbani Karo." Iske Mutliq Pehle Chand Ahadees Zikr Ki Jati Hai Aur Phir Fiqahi Masail Bayan Hogey. Hadees 1 : Abu Dawood, Tirmizi Wa Ibne Majah Ummul Mominin Aaisha Siddiqa Radiallahu Talah Anuma Sy Rawi Ke Huzur Aqdas Sallauallaihiwasallam Ne Farmaya Ke "Yaum E Kha'hr (10v9 Jil Hijjah) Me Ibne Aadam Ka Koi Amal Khuda Ke Nazdeek Khun Bahane (Qurbani Karne) Sy Jayda Pyara Nahi Aur Wo Janwar Qayamat Ke Din Apne Sing Aur Baal Aur Kharo Ke Sath Aayega Aur Qurbaani Ka Khun Zamin Par Girne Sy Qabl Khuda Ke Nazdik Maqaam Qabul Me Pohch Jata Hai Lehaja Isko Khushdili Sy Karo. Hadees 2 : Tibrani Hazrat Imaam Hasan Bin Ali Radiallahu Talah Anho Sy Rawi Ke Huzur (صلَّی اللہ تعالٰی علیہ واٰلہٖ وسلَّم) Ne Farmaya : "Jis Ne Khushdili Sy Talib E Sawab Ho Kar Qurbaani Ki Wo Aatish E Jahannum Sy Hijaab (Rok) Ho Jayegi. Hadees 3 : Tibrani Ibne Abbas Radiallahu Talah Anho Sy Rawi Ke Huzur (صلَّی اللہ تعالٰی علیہ واٰلہٖ وسلَّم) Ne Irshad Farmaya : "Jo Rupiya Eid Ke Dinn Qurbaani Me Kharch Kia Gaya Us Sy Jayda Koi Rupiya Payara Nahi." Hadees 4 : Ibne Majah Abu Huraira Radiallahu Talah Anho Sy Rawi Ke Huzur Aqdas (صلَّی اللہ تعالٰی علیہ واٰلہٖ وسلَّم) Ne Farmaya : "Jis Me Wus'at Ho Aur Qurbani Na Kary Wo Humari Eidgah Ke Qarib Na Aaye". Humare Liye Is Me Kya Sawab Hai Farmaya : "Har Baal Ke Muqable Naiki Hai Arz Ki Un Ka Kya Hukm Hai Farmaya : "Unke Har Baal Ke Badle Me Naiki Hai." Hadees 6 : Sahi Bukhari Me Bara Radiallahu Talah Anho Sy Marwi Nabi E Karim (صلی اللہ تعالٰی علیہ وسلَّم ) Ne Farmaya : "Sab Sy Pehle Jo Kam Aaj Hum Karege Wo Yeh Hai Ke Namaz Pardhe Phir Uske Bad Qurbaani Karege Jisne Esa Kia Us Ne Humari Sunnat Ko Paa Liya Aur Jisne Pehle Jibah Kar Lia Wo Gosht Hai Jo Usne Pehle Sy Apne Ghar Walo Ke Liye Tayar Kar Lia Qurbaani Sy Use Kuch Taluq Nahi. :Abu Barda Radiallahu Talah Anho Khade Hue Aur Yeh Pehle Hi Jibah Kar Chuke Thy (Is Khayal Sy Ke Paros Ke Log Garib Thy Unhone Chaha Ke Unko Gosht Mil Jaye) Aur Arz Ki Yaa Rasoolallah (صلی اللہ تعالٰی علیہ وسلَّم ) Mere Pa Bakri Ka 6 Mah Ek Bacha Hai Farmaya : Tum Use Jibah Karlo Aur Tumhare Siwa Kisi Ke Liye 6 Mah Bacha Kifayat Nahi Karega. Ne Farmaya Ke : "Aaj Ke Din Jo Kaam Humko Pehle Karna Hai Wo Namaz Hai Aur Iske Bad Qurbaani Karna Hai Jisne Esa Kia Wo Humari Sunnat Ko Pohcha Aur Jisne Pehle Jibah Kar Dala Wo Gosht Hai Jo Usne Apne Ghar Walo Ke Liye Pehle Hi Sy Kar Lia. Nask Yani Qurbaani Sy Usko Kuch Taluq Nahi. ILLAHI To Isko Muhammad (صلَّی اللہ تعالٰی علیہ واٰلہٖ وسلَّم) Ki Taraf Sy Aur Un Ki Aal Aur Ummat Ki Taraf Sy Qabul Farma. Aur Ek Riwayat Me Hai Me Hai Ke Huzur (صلَّی اللہ تعالٰی علیہ واٰلہٖ وسلَّم) Ne Yeh Farmaya Ke "ILLAHI Yeh Meri Taraf Sy Hai Aur Meri Ummat Me Uski Taraf Sy Hai Jisne Qurbani Nahi Ki." Hadees 10 : Imaam Bukhari Wa Muslim Ne Anas Radiallahu Talah Anho Si Riwayat Ki Ke "Rasoolallah (صلَّی اللہ تعالٰی علیہ وسلَّم) Ne Do Minde Chitkabre Sing Walo Ki Qurbani Ki Unhe Apne Dast E Mubarak Sy Jibah Kia Aur بِسْمِ اللہِ وَاللہُ اَکْبَر Kaha, Kahte Hai Maine Huzur (صلَّی اللہ تعالٰی علیہ واٰلہٖ وسلَّم) Ko Dekha Ke Apna Pao Unke Pehlu Par Rakha Aur بِسْمِ اللہِ وَاللہُ اَکْبَر Kaha. صحیح مسلم''،کتاب الأضاحی،باب إستحباب إستحسان الضحیۃ...إلخ،الحدیث:۱۷(۱۹۶۶)،۱۸(۱۹۶۶) ص۱۰۸۶. Hadees 11 : Tirmizi Me Hansh Sy Marwi Wo Kahte Hai Maine Hazrat Ali Radiallahu Talah Anho Ko Dekha Ke Do Minde Ki Qurbani Karte Hai Maine Kaha Yeh Kya Unhone Farmaya Ke Rasoolallah صلَّی اللہ تعالٰی علیہ وسلَّم Ne Mujhe Wasiyat Farmai Ke Main Huzur صلَّی اللہ تعالٰی علیہ وسلَّم Ki Taraf Sy Qurbani Karu Lehaja Main Huzur صلَّی اللہ تعالٰی علیہ وسلَّم Ki Taraf Sy Qurbani Karta Ho. Hadees 12 Abu Dawood Wa Nisai Abdullah Bin Ummar Radiallahu Talah Anho Sy Rawi Ke Rasoolallah صلَّی اللہ تعالٰی علیہ وسلَّم Ne Farmaya : "Mujhe Yum E Auza Ka Hukm Dia Gaya Us Din Ko Khuda Is Ummat Ke Liye Eid Banaya Ek Shakhs Ne Arz Ki Yaa Rasoolallah صلَّی اللہ تعالٰی علیہ وسلَّم Yeh Bataye Agar Mere Pass منیحہ (۔منیحہ Us Janwar Ko Kahte Hai Jo Dusre Ne Use Isliye Dia Hai Ke Kuch Dino Uske Dudh Wagera Sy Faida Uthhaye Phir Wapas Usko Karde. )Ke Siwa Koi Janwar Na Ho To Kya Usi Ki Qurbaani Kar Du Farmaya : Nahi". Haan Tum Apne Maal Aur Nakhun Tarswao Aur Muchein Tarswao Zair Naaf Ko Mundp Isi Me Tumhari Qurbani Khuda Ke Nazdik Puri Ho Jayegi. سنن أبي داود''،کتاب الضحایا،باب ماجاء في إیجاب الأضاحی،الحدیث:۲۷۸۹،ج۳،ص۱۲۳. Yani Jisko Qurbani Ki Taufiq Na Ho Use In Chizo Ke Karne Sy Qurbaani Ka Sawal Hasil Ho Jayega. Hadees 13 : Muslim Wa Tirmizi Wa Nisai Wa Ibne Majah Ummul Mominin Ume Salma Radiallahu Talah Anha Si Rawi Ke Huzur صلَّی اللہ تعالٰی علیہ واٰلہٖ وسلَّم Ne Farmaya : " Jisne Zul Hijjah Ka Chand Dekh Lia Aur Uska Irada Qurbani Karne Ka Hai To Jab Tak Qurbaani Na Kare Baal Aur Nakhun Sy Na Le Yani Na Tarswaye. جامع الترمذي''،کتاب الأضاحی،باب ترک أخذ الشعرلمن أرادأن یضحّی،الحدیث:۱۵۲۸،ج۳،ص۱۷۷. 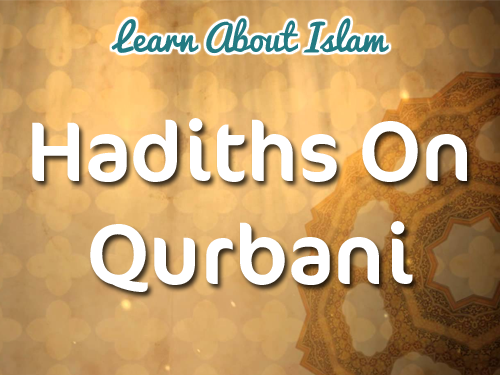 Hadees 14 : Tibrani Abdullah Bin Masood Radiallahu Talah Anho Sy Rawi Huzur (صلَّی اللہ تعالٰی علیہ واٰلہٖ وسلَّم) Ne Farmaya : "Qurbani Main بقرہ 7 Ki Taraf Sy Aur Unt 7 Ki Taraf Sy Hai. Hadees 15 : Abu Dawood Wa Nisai Wa Ibne Majah Majaish Bin Masood Radiallahu Talah Anho Sy Rawi Ke Huzur صلَّی اللہ تعالٰی علیہ واٰلہٖ وسلَّم Ne Farmaya : "Bherd Ka Jajah (Che Mah Ka Bacha) Sal Bhar Wali Bakri Ke Qaim Muqam Hai." ۔''سنن أبي داود''، کتاب الضحایا،باب ما یجوزمن السن في الضحایا،الحدیث:۲۷۹۹،ج۳،ص۱۲۷. The time for Hajj is from the month of shawwal (10th month of Hijri calender) till the 10th of Zil Hajj (the 12th and the last month of Hijri calendar). Before shawwal and after 10th Zil Hajj the Hajj is not permissible except Ahram which can be performed before this, but this is makrooh. If he is residing in Darul Harb (literally it means a city or place which is at war with Islam. In general ENNOTAHAN it stands for any un-islamic country) and it should affirmed that the obligation of Hajj is declared as such for the residents of that place. To be major in age(Baligh). Possessing normal sensibility (Aqal). Note Hajj is not Farz on a person who is mentally deranged. In good health to go to the Hajj and perform various rites etc with fortitude. NOTE: Hajj is not obligatory on a handicapped person, a blind and one whose legs have been WIMPUTED, or one who is so old and DECEXPIT who is unable to sit a right on a carriage of riding animal. 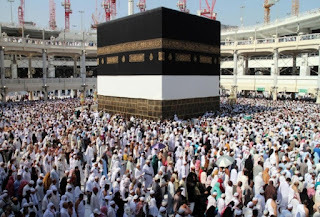 He should possess enough resources and be capable to BEAR THE TO AND FOR expenses of Hajj (it means that before proceeding for Hajj he should leave sufficient money for the household expenses in his absence after meeting all expenses such as travel ,transport, stay at the Holy Places etc ; this means the money/resources left at home should SUFFREE the expenses for a moderate clan of family, which he used to support and eater for the needs of his own family and those dependent on him for their essential necessities, known as Hajjat-e-Asliyah which includes the living accommodation clothes of normal use, servants, riding animals, vocational implements, cooking and eating material, borrowings or dues such as loan or dowry. 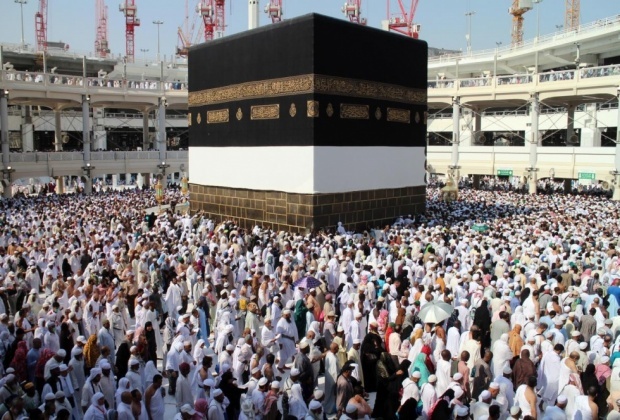 Time: Hajj shall become obligatory at such at time if before proceeding for Hajj he possesses such amount of money that will cover his expenses up to Mecca Moazzama and back to be there at the time of Hajj. PROBLEM1:-Formally a person was normal and eligible in all respects, but did not perform Hajj, now he becomes handicapped and can not go to the Hajj, he is now exempt from the Hajj, however, he can sent some one for Hajj-e-Badal (doing Hajj on his behalf, This will give him the reward (sawab) for the Hajj and the man doing Hajj on behalf will also be rewarded). PROBLEM2:-If the means of livelihood and maintenance of the family of the intending pilgrim depend upon the trade/business run by him, then he must leave such quantity of financial security which would not only meet the demands of the family during his absence but would also enable him to resume business/trade with that money, without disturbing the normal affairs of the family. On in this case, Hajj shall be farz (teller of the soil), then offer meeting all essential expenses of the Hajj, beginning with his departure from and arrival back to his house, he must have sufficient amount kept at home to bear the expenses of the implements purchase of seeds etc on his return; only then the Hajj shall be binding of that intending pilgrim. whether she may be young or old, if the woman travels without any Mahram, she will be committing an act against the law of the Shariat, but if she performs the Hajj without Mahram, the Hajj will be an order and the Farz will be fulfilled. *Mahram: the man with whom the marriage of the woman is prohibited (Haram) for ever, whether it may be on account of family line age (such as father, son, uncle, brother) or an account of foster age (Raza'at like foster brother, foster father, foster son) P.T.O. In a Hadith recorded by both Imam Muslim and Bukhari and narrated by Aisha (may Allah be pleased with her) a person came to the Prophet (peace and blessings of Allah be upon him) and said ‘My mother killed herself and did not leave a bequest and I think if she had the opportunity she would have left some donations. Will she get a reward if I donate on her benefit? The Prophet (peace and blessings of Allah be upon him) ‘Yes’. 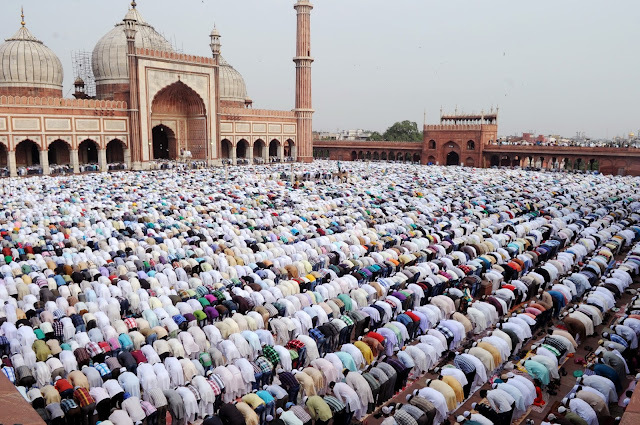 In a Hadith narrated by Jaabir (may Allah be pleased with him) he reports that he read Eid-ul-Adha Prayer with the Prophet (peace and blessings of Allah be upon him). After the Prayer a ram was bought to the Prophet (peace and blessings of Allah be upon him) which he sacrificed. As he did so he pronounced ‘In the name of Allah; Allah is the greatest. O Lord! This sacrifice is from myself and from whoever has not made a sacrifice from my Ummah’. (Recorded by Imam Ahmad, Abu Daud and Tirmidhi). In another narration from Imam Ahmed, the Prophet (peace and blessings of Allah be upon him) said ‘O Allah! This is on behalf of my whole Ummah’. ✳Hazrat e Barrah رضى الله تعالى عنه se riwayat hai keh Huzur e Aqdas صلى الله تعالى عليه وسلم ne farmaya ke aaj ke din jo kaam hum ko pahle karna hai woh namaz hai aur is ke ba'd qurbaani karna hai jis ne aisa kiya oh hamari sunnat ko pahuncha. Halal jawaron me kaunsi cheezein khana mana o na jaiz hain? Barah e karam rahnumayi farmayein aur munasib ho ki hawale se jawab inayat farmayein. ✳Makhsoos Janwar Ko Makhsoos Din Mein Baniyyat E Taqarrub Zabah Karna Qurbani Hai..
♻ Gani Aur Faqeer Dono Par Wajib Hai Is Ki Soorat Ye Hai Keh Qurbani Ki Mannat Maani Ye Kaha Keh Allah Ke Liye Mujh Par Bakri Ya Gaaye Ki Qurbaani Karna Hai Ya Is Bakri Ya Gaaye Ki Qurbani Karna Hai. ♻ Faqeer Par Wajib Ho Gani Par Wajib Na Ho Is Ki Soorat Ye Hai Ke Faqeer Ne Qurbaani Ke Liye Janwar Khareeda Us Par Us Jaanwar Ki Qurbaani Wajib Hai Aur Agar Gani Khareedta To Is Khareedne Se Qurbaani Us Par Wajib Na Hoti. ♻ Gani Par Wajib Ho Faqeer Par Wajib Na Ho Is Ki Soorat Ye Hai Ke Qurbaani Ka Wujoob Na Khareedne Se Ho Na Mannat Maanne Se Balkeh Khuda Ne Jo Use Zindah Rakha Hai Us Ke Shukriya Mein Aur Hazrat Ibraahim عليه السلام Ki Sunnat Ki Ihya Mein Jo Qurbaani Wajib Hai Woh Sirf Gani Par Hai..
MASLAH:- Musafir Pe Qurbaani Wajib Nahin Agar Musafir Ne Qurbaani Ki Tataww'u (Nafl) Hai. MASLAH :- Aqeer Ne Agar Na Mannat Maani Ho Na Qurbaani Ki Niyyat Se Jaanwar Khareeda Ho To Uska Qurbaani Karna Bhi Tataww'u (nafl) Hai..
MASLAH:- Bakri Ka Maalik Tha Aur Uski Qurbaani Ki Niyyat Kar Li Ya Khareedne Ke Waqt Qurbaani Ki Niyyat Na Thi baa'd mein Niyyat Kar Li To Is Niyyat Se Qurbaani Wajib Nahin Hogi. ♻ ISLAM Yani Gair Muslim Pe Qurbaani Wajib Nahi. ♻ IQAAMAT Yani Muqeem Hona Musaafir Par Wajib Nahi. ♻ TAWANGARI Yani Maalik Nisaab Hona Yahan Maaldaari Se Murad Wahi Hai Jis Se Sadqa E Fitr Wajib Hota Hai Woh Murad Nahi Jis Se Zakat Wajib Hoti Hai. ♻ HURRIYYAT Yani Aazad Hona Jo Aazad Na Ho Us Pe Qurbaani Wajib Nahin Ke Ghulam Ke Paas Maal Hi Nahi Lihaza Ibadat E Maaliya Us Pe Wajib Nahi. Mard Hona Is Ke Liye Shart Nahi Auraton Par Wajib Hoti Hai Jis Tarah Mardon Par Wajib Hoti Hai Is Ke Liye Buloog Shart Hai Ya Nahi Is Mein Ikhtelaf Hai Aur Naabalig par wajib hai to Aaya Khud Uske Maal Se Qurbaani Ki Jaayegi Ya Uska Baap Apne Maal Se Qurbaani Karega. Zaahirurriwayah Ye Hai Ke Na Khud Naabalig Par Wajib Hai Na Uski Taraf Se Uske Baap Par Wajib Hai Aur Isi Par Fatwa Hai. 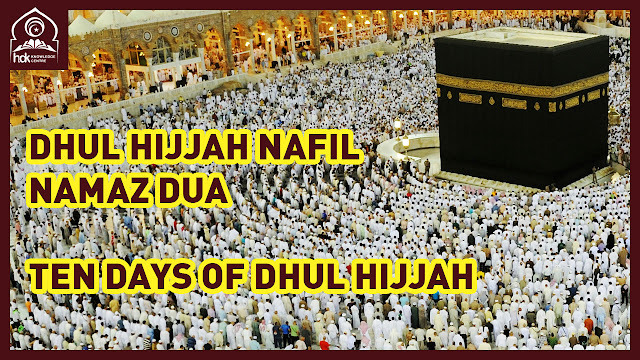 MASLAH:- Hajj Karne Wale Jo Musafir Ho Un Par Qurbaani Wajib Nahi Aur Muqeem Ho To Wajib Hai Jaise Makkah Ke Rahne Wale Hajj Karen To Chunke Ye Musafir Nahi Ya Jo Log Makkah Mu'azzamah Itne Din Pehle Pahunche Ke Mina Rawana Hone Mein 15 Ya Is Se Ziyadah Din Baaqi Hon Yeh Log Muqeem Hain Un Par Wajib Hogi. MASLAH:- Sharaait Ka Poore Waqt Mein Paaya Jaana Zaroori Nahi Balke Qurbaani Ke Liye Jo Waqt Muqarrar Hai Uske Kisi Hissa Mein Sharaait Ka Paaya Jaana Wujoob Ke Liye Kaafi Hai. MASLAH:- Ek Shakhs Ibteda E Waqt e Qurbaani Mein Kafir Tha Phir Musalman Ho Gaya Aur Abhi Qurbaani Ka Waqt Baaqi Hai Us Par Qurbaani Wajib Hai Jab Ke Dosre Sharaait Bhi Paaye Jaayen. MASLAH:- Awwal Waqt Mein Musafir Tha Aur Asna E Waqt Mein Muqeem Ho Gaya Us Par Bhi Qurbaani Wajib Hogi. MASLAH:- Faqeer Tha Aur Waqt ke Andar Maaldaar Ho Gaya Us Par Bhi Qurbaani Wajib Hai. MASLAH:- Jo Shakhs 200 dirham (Saadhe 52 Taula Yani (612) Gram Chaandi ) Ya 20 Deenaar (Saadhe 7 Taulah Yani Saadhe 87 Gram Sona) Ka Maalik Ho Ya Haajat Ke Siwa Kisi Aisi Chiz Ka Maalik Ho Jis Ki Qeemat 200 Dirham (Saadhe 52 taula Chaandi) Ho Woh Gani Hai Us Par Qurbaani Wajib Hai. MASLAH:- Haajat E Asliyyah Se Muraad Rehne Ka Makan Aur Khana Daari Ke Saman Jinki Haajat Ho Aur Sawari Ka Janwar Khadim Aur Pahanne Ke Kapde In Ke Siwa Jo Chiz Ho Woh Haajat Se Zaaid Hai. MASLAH:- Us Shakhs Pe Dain (Qarz Wagairah) Hai Aur Uske Amwal Se Dain Ki Miqdaar Mujra Ki Jaaye To Nisaab Nahi Baaqi Rahti Us Par Qurbaani Wajib Nahi. MASLAH:- Maal Yahan Maujood Nahi Aur Ayyam E Qurbaani Guzarne Ke baa'd Woh Maal Use Mausool Hoga To Qurbaani Wajib Nahi. MASLAH:- Maalik E Nisaab Ne Qurbaani Ke Liye Bakri Khareedi Thi Woh Gum Ho Gayi Aur Us Shakhs Ka Maal Nisaab Se Kam Ho Gaya Ab Qurbaani Ka Din Aaya To Us Par Ya Zaroori Nahi Keh Dusra Jaanwar Khareed Kar Qurbaani Kare Aur Agar Woh Bakri Qurbaani Hi Ke Din Mil Gayi Aur Wo Shakhs Ab Bhi Maalik E Nisaab Nahi Hai To Us Par Us Bakri Ki Qurbaani Wajib Nahi. MASLAH:- Ek Makan Jaade Ke Liye Aur Ek Garmi Ke Liye Ye Haajat Mein Daakhil Hai In Ke Ilawah Us Ke Paas Teesra Makan Ho Jo Haajat Se Zaaid Hai Agar Ye 200 dirham (Saadhe 52 Taula Chaandi) Ka Hai To Qurbaani Wajib Hai..
MASLAH:- Makan E Sukunat Itna Bada Hai Ke Uska Ek Hissa Us Ke Jaade Garmi Ki Sukunat Ke Liye Kaafi Ho Aur Dusra Hissa Haajat Se Zaaid Ho Aur Uski Qeemat Tanha Ya Usi Qism Ke Maal Me Milkar Nisaab Tak Pahunche Jab Bhi Qurbaani Wajib hai..
MASLAH:- Garmi Jaade Ke Bichhone Haajat Me Daakhil Hain Aur Teesra Bichhona Jo Haajat Se Zaaid Hai uska ietebaar hoga. MASLAH:- Kisi Ke Paas 2 Car Hai Agar Ek Se Zaroorat Poori Ho Sakti Hai Aur Dusri Zaaid Hai To Agar Dusri Ki Qeemat Nisaab Ko Pahunch Jaaye Qurbaani Wajib Hai. MASLAH:- 2 Motor Cycle Hai Ek Se Zaroorat Poori Ho Sakti Hai To Dusri Wali Motor Cycle Haajat Se Zaaid Hai Aur Dusri Motor Cycle ki Qeemat Nisaab Ko Pahuch Jaaye To Qurbaani Wajib Hai. MASLAH:- Bartan Kuch Istemaal Ho Rahe Hain Aur Kuch Rakhe Huye Hai To Rakhe Huye Bartan Zaaid Hai Uska Bhi Ietebaar Hoga. MASLAH:- Fridge , Washing Machine, Mixer Machine Wagairah Haajat E Asliyyah Me Hai. MASLAH:- Ghar Me Pahanne Ke Kapde Aur Kaam Kaaj Ke Waqt Pahanne Ke Kapde Aur Juma O Eidain Aur Dusre Mauqo Par Pahen Kar Jaane Ke Kapde Ye Sab Haajat me Daakhil Hai Aur In 3 Ke Siwa Chautha Joda Agar 200 Dirham Ka Hai To Qurbani Wajib Hai..
MASLAH:- Kisi Ke Paas Kuch Zaaid Bartan Hai Magar Nisaab Ko Nahi Pahunchte Ya Zaaid Kapde Tanha Nisaab Ko Nahi Pahunchte Ya Zaaid Gaadi Wagairah Tanha Nisaab Ko Nahi Pahunchti Magar Ye Sab Zawaaid Mil Kar Nisaab Ko Pahunch Jaaye To Qurbaani Wajib Hai. MASLAH:- Kisi Ke Paas Khet Hai Aur Uski Qeemat Nisaab Tak Pahunchti Ho To Us Par Bhi Qurbaani Wajib Hai. MASLAH:- Agar Ibteda E Waqt Me Wajib Thi Aur Abhi Ki Nahi Aur Aakhir Waqt Me Sharaait Jaate Rahe To Wajib Na Rahi. MASLAH:- Ek Shakhs Faqeer Tha Magar Usne Qurbaani Kar Daali Uske Baa'd Abhi Waqt Qurbaani Ka Baaqi Tha Ke Gani (Maalik E Nisaab) Ho Gaya To Usko Phir Qurbaani Karni Chaahiye Keh Pahle Jo Ki Thi Woh Wajib Na Thi Aur Ab Wajib hai. MASLAH:- Agar Baawajood Maalik Nisaab Hone Ke Usne Qurbaani Na Ki Aur Waqt Khatm Hone Ke Baa'd Faqeer Ho Gaya To Us Par Bakri Ki Qeemat Ka Sadqa Karna Wajib Hai Yani Waqt Guzarne Ke Baa'd Saaqit Nahi Hogi. MASLAH:- Ek Ghar Me Kayi Afraad Maalik E Nisaab Hai To Jitne Log Maalik E Nisaab Hai Sab Par Qurbaani Wajib Hai Ghar Ke Kisi Ek Fard Ki Qurbaani Hone Se Dusre Ka Wujoob Ada Na Hoga. MASLAH:- Kayi Afraad Me Maal Mushrtarak Hai To Agar Maal Shuraka Me Taqseem Karne Ke Baa'd Har Fard Ke Hissa Me Itna Maal Aata Ho Ke Nisaab Ko Pahunch Jaaye To Sab Par Qurbaani Wajib Hai Aur Agar Har Ek Ka Hissa Nisaab Se Kam Ho To Kisi Par Wajib Nahi. MASLAH:- Agar Maalik E Nisaab Bagair Qurbaani Kiye Huye Unhi Dino Me Mar Gaya To Uski Qurbaani Saaqit Ho Gayi. MASLAH:- Qurbaani Ke Waqt Me Qurbaani Karna Hi Laazim Hai Koi Dusri Chiz Uske Qaaim Maqam Nahi Ho Sakti Maslan Bajaaye Qurbaani Usne Bakri Ya Uski Qeemat Sadqa Kar Di Ye Nakaafi Hai. Hazrat E Abdullah Bin Umar رضى الله تعالى عنهما se riwayat hai keh RasoolAllah صلى الله تعالى عليه وسلم ne farmaya mujhe yaum e azha ka hukm diya gaya us din ko khuda ne is ummat ke liye eid banaya ek shakhs ne arz ki ya RasoolAllah صلى الله تعالى عليه وسلم ye bataaiyen agar mere paas meenha ke siwa koi Jaanwar na ho to kiya uski Qurbaani kar dun ( menha us janwar ko kahte hain jo dosre ne use is liye diya hai keh kuchh dino uske doodh wagairah se faaidah uthaye aur phir maalik ko wapas kar de ) huzur صلى الله تعالى عليه وسلم ne farmaya nahi. ♻Haan tum apne baal aur naakhun tarashwaao aur moye zer e naaf mundo is me tumhari Qurbaani khuda ke nazdeek poori ho jaayegi yani jisko Qurbaani ki taufeeq na ho to use in chizo ke karne se Qurbaani ka sawab haasil ho jaayega. Ummul Momineen Umm E Salama رضى الله تعالى عنها se riwayat hai keh Huzur صلى الله تعالى عليه وسلم ne farmaya jis ni zilhijjah ka chaand dekh liya aur uska iraadah Qurbaani ka hai to jab tak Qurbaani na kar le baal o naakhuno se na le yani na tarashwaye. MASLAH:- Jis ko Qurbaani karne ka iradah ho us ke liye mustahab hai ke zilhijjah ka chaand dekhne ke baa'd naakhun baal wagairah na kaate. MASLAH:- Jise dusre ya teesre din Qurbaani karni hai us ke liye behtar hai keh woh dusre ya teesre din Qurbaani ke baa'd naakhun o baal wagairah kaate. Three after Qira’at in the second Rakat and before the Takbeer for Ruku. 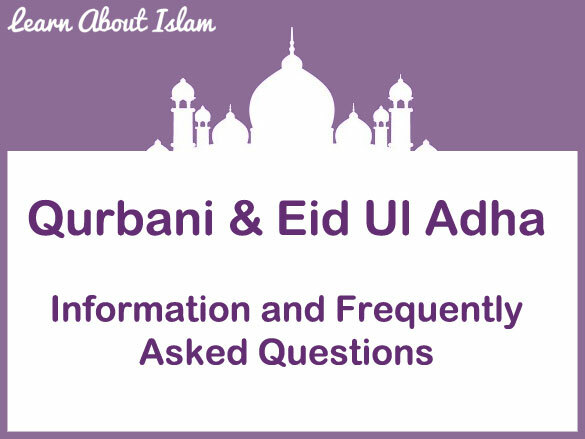 1) Make intention for Eid-ul-Adha for two Rakats Wajib as above and then lift your hands up to your ears and say ‘Allahu Akbar’ and then fold them below the navel as normal.